Store your jewelry individually to keep them from scratching each other. Avoid contact with perfume, body lotion, hairspray or any other chemical that may harm the shine of the stone. To clean your jewelry, use a warm, soapy water soak and a soft brush - especially when cleaning jewelry that contains gemstones. Vintage multi-layer long pearl necklace with crystal flower brooch (not removable from the necklace), a great flapper dress accessory jewelry, also can be used as a sweater chain. The length of each single layer: 17.3", 29.1", 31.5". Perfect length to build a sense of drape. Material: imitation pearl strings, crystal flower and alloy. Great quality of materials and craftsmanship. Vintage styling right off the Great Gatsby runway! 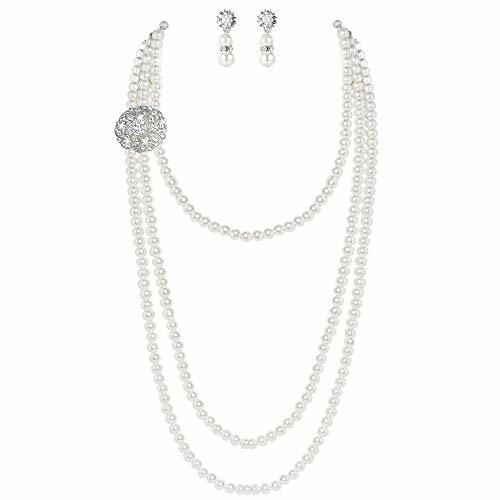 Perfect for wedding, homecoming, prom, anniversary, formal party, art themed party, 1920's Great Gatsby themed party. Goes well with flapper dress, vintage outfit, or any dress up that needs extra finishing touch, also excellent for everyday wear! If you have any questions about this product by BABEYOND, contact us by completing and submitting the form below. If you are looking for a specif part number, please include it with your message.